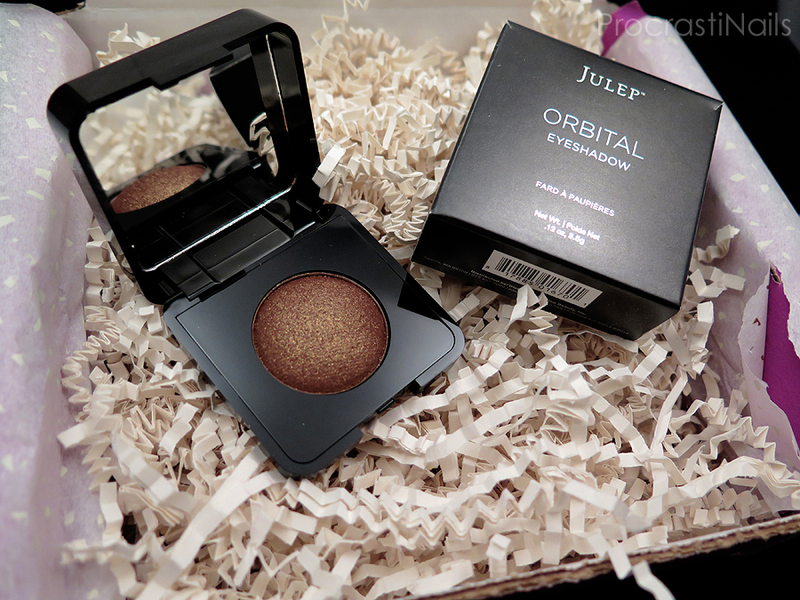 My Julep Maven (December 2014) Customized Box Unboxing, Swatch and Review! Hooo-ey! This box was a roller coaster from start to finish! Unexpected highs and unexpected lows from the products I picked up, but that's part of the fun of subscription boxes right? :) The overall polish collection wasn't really speaking to me so I once again went with the featured beauty item and also picked up a new effect top coat. Add a punch of glitter to my selections (because New Years is coming up after all) and we're good to go! 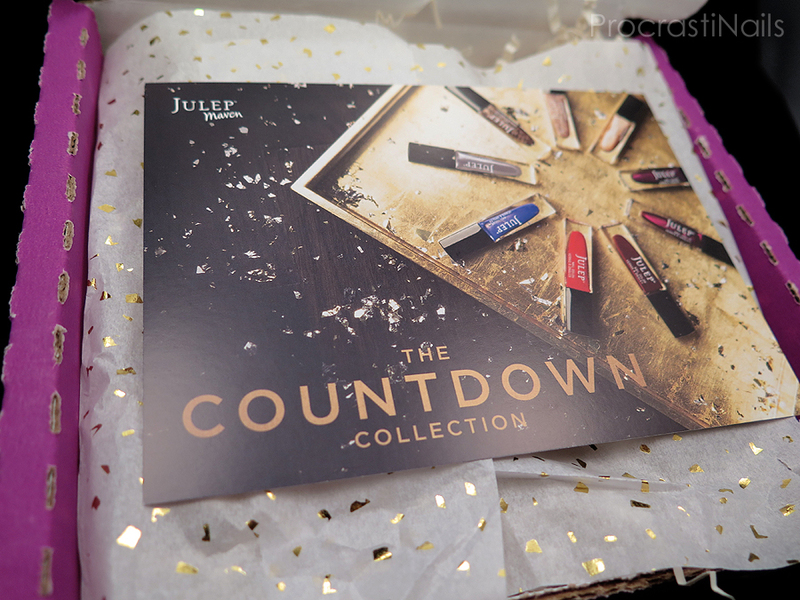 New Years Eve is coming and the year is drawing to a close, and appropriately enough Julep decided to name their December collection The Countdown Collection. There were a few true chromes in the set that I originally wanted to try but they're shades I already have from multiple other brands (silver and rose gold) so I passed. I feel Julep could have pumped it up with more glitter (there were two this month but both were alterations to previous formula's from what I can tell) so I wasn't overly excited about the base collection. Candy was once again our free gift this month, and I have to say: these are the most American mints I have ever seen. They have Made In America printed on them with a flag and the wrapping is entirely red, white and blue. As a Canadian I find this hilarious for some reason. It's like making maple syrup candies and writing CANADA all over them. Here is the coupon code for this month, I assume we aren't getting discount codes for the beauty items anymore because Julep keeps selling out of them before they even release. 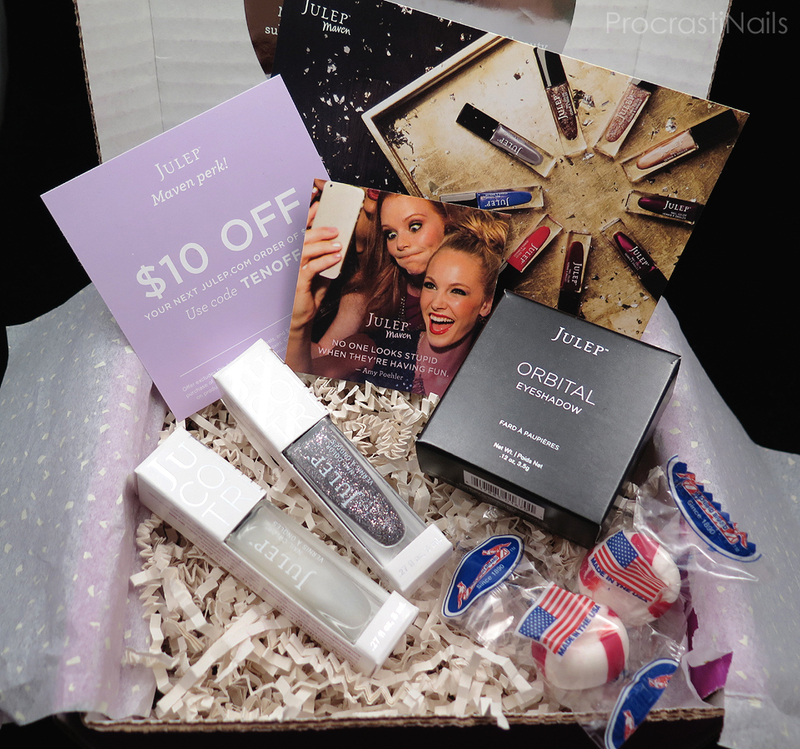 TENOFF for $10 off your next Julep order of $20+, two uses per customer, valid until Jan 31/15. This month the beauty items were Orbital Eyeshadows, and since the collection didn't wow me I decided to pick one up. 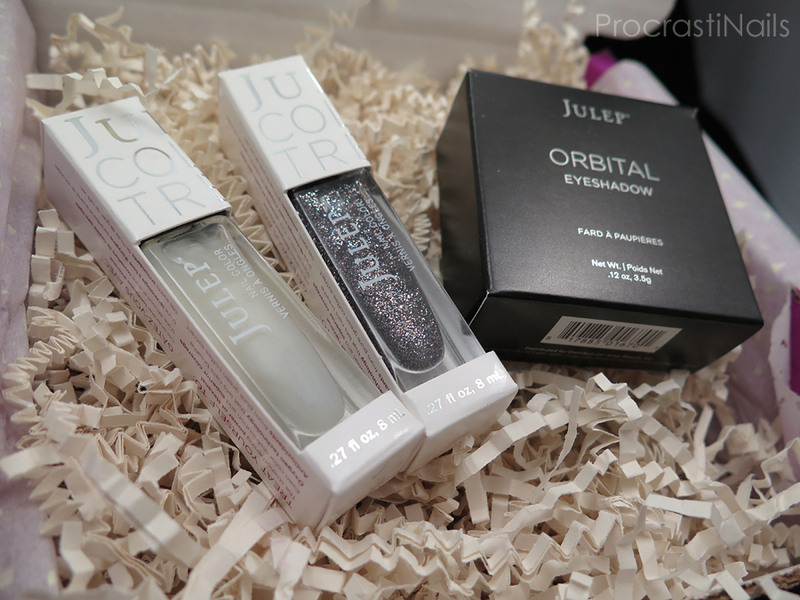 Julep also introduced a new silk finish top coat and they allowed it as a swap-in option for the boxes so I grabbed that up (because of my loooove of Julep's silk finishes which you'll get to read about in just a minute). So let's dig into the box! Description: Cocoa with gold pearlescence eyeshadow with triple the pigment for intense brightness, incredible stamina, and endless looks. I'm sorry I don't have a swatch of the shadow to share with you - makeup swatches aren't really my thing. On first application I didn't find this shadow as pigmented as I was hoping, but it definitely holds a TON of shimmer. I'm looking forward to playing around with it! 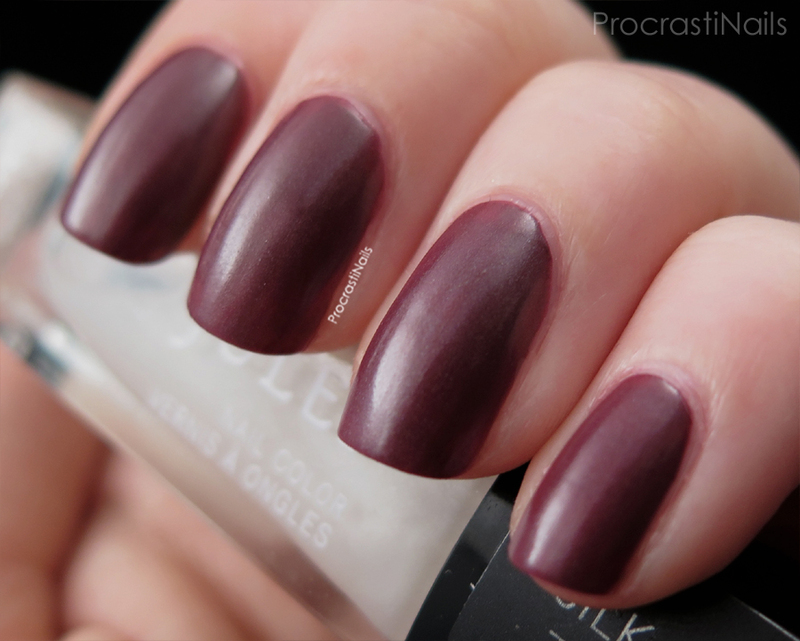 I swatched one layer of this top coat on top of two coats of Julep Aisha, and I have to say I'm disappointed in it. Julep's silk finish is one of my all-time favourite polish finishes (basically a soft matte) and every time there's a new silk polish available I snag it. It was a no-brainer for me to pick the top coat up when it came out - "Now I can make all my Julep polishes silk polishes," I thought to myself! Unfortunately where I expected a soft and possibly shimmery matte I got a semi-glossy milky finish. Hm. You can take a look at some of my silk polishes from January 2014's Boudoir Collection to see what I was hoping for. I also did a comparison with a glossy top coat (Julep's Freedom Polymer Top Coat) so you could see the difference. I really expected there to be less gloss with the silk top coat - as you can see it just made the polish look foggy. :/ Hm. Maybe I'll like it more with lighter shades or shimmery polishes? Here's hoping! Chatoya thankfully makes up for my disappointment from the silky top coat - this stunning glitter bomb blew me away from the moment I started applying it! And to think that it was a last minute adjustment to my box! I used three coats (without top coat) to make this look like full glitter, but you could totally do one or two to make it a glitter topper instead. It describes itself as a 'platinum,' and fair enough from a distance it does look that way. But from this macro shot you can see that the glitter is actually a combo of silver, pink and blue. 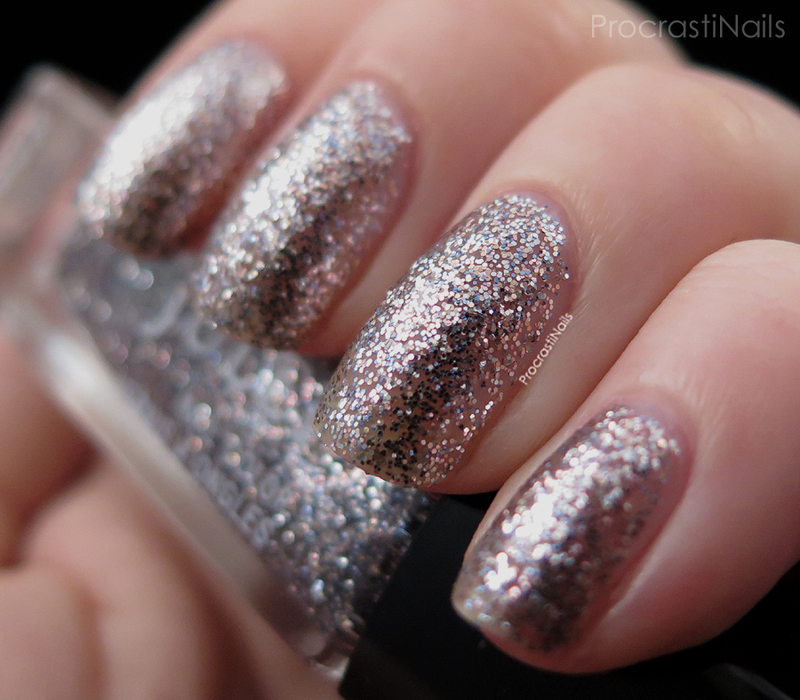 This is basically Julep Clio with smaller glitter particles (which I totally don't mind). See what I mean about highs and lows? The Silk Effect Top Coat was less enjoyable than expected (and I did have quite high expectations - though I didn't think they would be hard to meet), and the glitter bomb I threw in on a whim turned out to be awesome! If you're looking for gifts for the holidays remember to check out Julep's 12 Days of Very Merry Daily Deals! A new deal every day including free gifts, discounts and more. The box at the top of the column to the right is set to update daily with each new deal, so check back often to see what's up! I like the look of Chatoya a lot. I'm really loving that glitter polish and the eyeshadow! I can definitely see why you're disappointed with the silk topcoat though, it probably would have been really nice if it gave the same finish as their silk polishes! I can see why you are a bit let down by the silk topcoat - the original silk finishes are prettier I think. However, the glitter and eyeshadow look great! I really like the orbital eyeshadows! December was a good box for me. I'm excited to receive my January box soon. I just hope they start sending sample packets as the free surprise like they used to. As much as I like candy I want to try some of their products in sample sizes. That shadow looks really nice. Too bad it's not as pigmented as you wanted. I love shimmer though so I'd just cake it on hah! That one polish, Chatoya, is nice as well. I love sparkles. Great photos ( I feel like I'm saying that on all of your blog posts but they really are great! ).